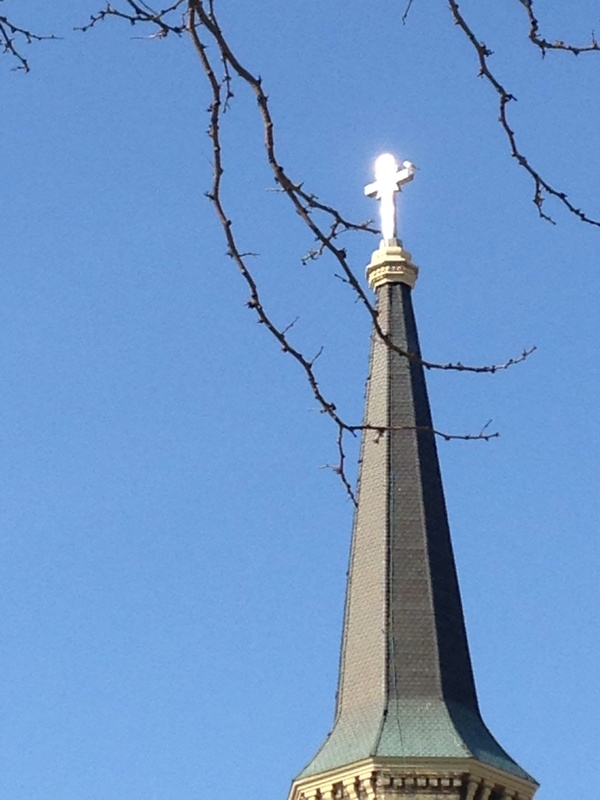 The glint of sunlight reflecting off this cross atop Old St. Mary’s Church caught my eye as I walked back to my office around 9:00 this morning after teaching my first class. Here’s a reverse shot I took a bit farther down the hill, just to give you an idea of how bright the sun is today and how cloudless the sky after a few weeks of windy, wet, chilly weather. In a way this glowing cross reminds me of some other, far more famous glowing crosses: those of the cemetery in Ansel Adams’ Moonrise, Hernandez, New Mexico. Here’s a close-up area of detail, in case you aren’t seeing the almost supernaturally glowing crosses very well here, although some clarity is lost in my enlargement of this print. We were sailing southward along the highway not far from Espanola when I glanced to the left and saw an extraordinary situation – an inevitable photograph! I almost ditched the car and russed [sic] to set up my 8×10 camera. I was yelling to my companions to bring me things from the car as I struggled to change components on my Cooke Triple-Convertible lens. I had a clear visualization of the image I wanted, but when the Wratten No. 15 (G) filter and the film holder were in place, I could not find my Weston exposure meter! The situation was desperate: the low sun was trailing the edge of the clouds in the west, and shadow would soon dim the white crosses. 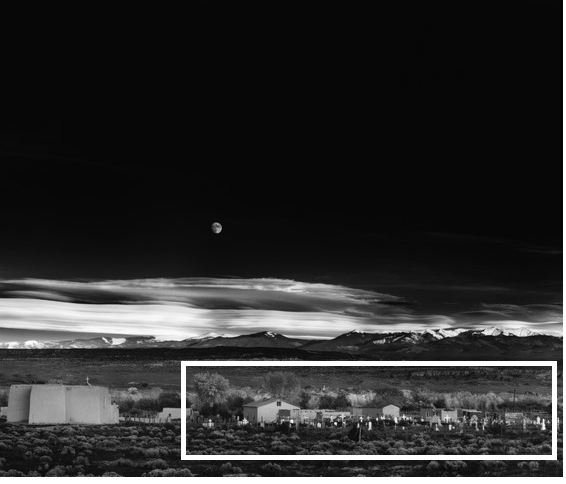 I was at a loss with the subject luminance values, and I confess I was thinking about bracketing several exposures, when I suddenly realized that I knew the luminance of the moon – 250 c/ft2. Using the Exposure Formula, I placed this luminance on Zone VII; 60 c/ft2 therefore fell on Zone V, and the exposure with the filter factor o 3x was about 1 second at f/32 with ASA 64 film. I had no idea what the value of the foreground was, but I hoped it barely fell within the exposure scale. Not wanting to take chances, I indicated a water-bath development for the negative. Realizing as I released the shutter that I had an unusual photograph which deserved a duplicate negative, I swiftly reversed the film holder, but as I pulled the darkslide the sunlight passed from the white crosses; I was a few seconds too late! I think I may love that story even more than I love the photograph itself. So dramatic! No such excitement with my own photo, sadly. I just took note of the shining silver cross, stopped walking, pulled out my phone. Yeah, I took several shots from slightly different positions so as to get the most incandescent reflection possible. But no car to ditch, no companions to yell instructions at, no equipment to fumble with, no ticking clock, no setting sun. 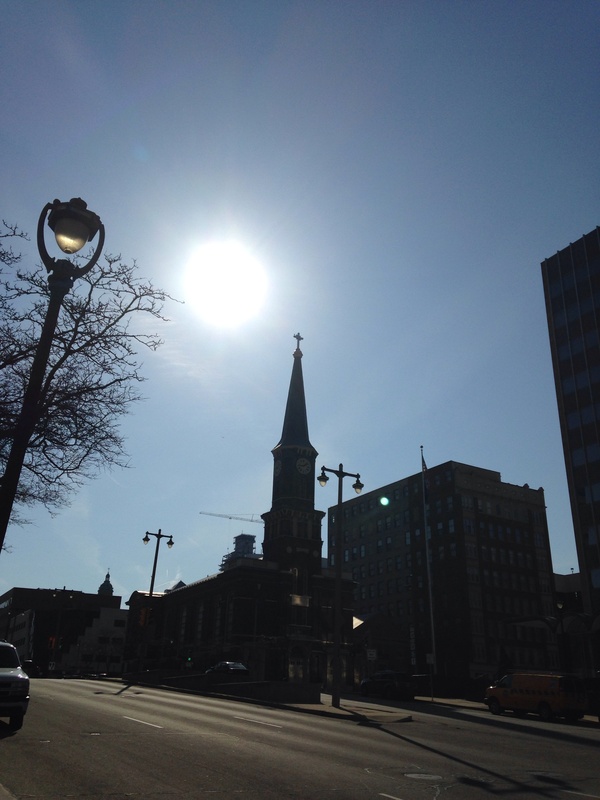 This entry was posted in Art, Creativity, Milwaukee, Photography and tagged Ansel Adams, Downtown Milwaukee, glowing cross, incandescent cross, Moonrise Hernandez New Mexico, Old St. Mary's Church, sun shining on cross. Bookmark the permalink. I can just picture you, though. Stopping in your tracks. Whipping out the phone. Different technology. Same enthusiasm!! Wonderful capture!! You’re no Ansel Adams — and that is a good thing. Adams’ work always has this icy calculation about it. I think you’re more like Weegee, the great tabloid crime- and street-scene photographer of the 1930s and 1940s. When asked the secret of his success, he said, “F/8 and be there!” Weegee would approve of your cross photos! Oh, my goodness, you just made my day! Thank you! I know that quote, although I’d forgotten who said it. And I love that quote! Thank you for reminding me. I think that “F/8 and be there” is going to be my new motto, seriously.